For those that don't know, I have struggled with bad skin for as long as I can remember. I even recall the exact day in middle school when a boy made fun of me for having a zit on my face. I was traumatized. I've spent over half my life trying to prevent and cover my unsightly skin. It took over a decade, but I've finally learned how to keep my skin blemish free. The trick: stop using so much junk on my face! I wash my face twice a day using Cetaphil and use an oil-free moisturizer once a day, that's it. After consulting my dermatologist and working out exactly what was causing my skin to act up, we determined that all the additional product I was putting on my skin was what was clogging my pores. So with years of bad skin under my belt, I'd like to think I'm a foundation expert. I've tried just about everything to make my skin appear smooth and even. From high end department store makeup to affordable drugstore products – I've used them all. So which ones are at the top of my list? 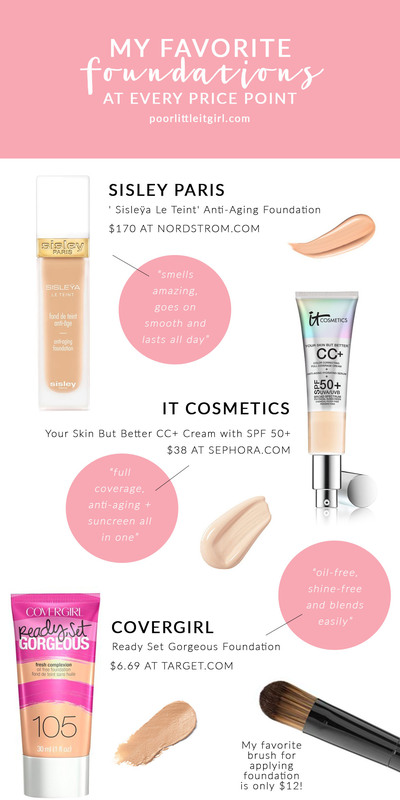 I've broken down the top three foundations I currently use that I love, at each price point. So no matter your budget, you can hopefully try some of these products and find one that works for you! I was recently introduced to the Sisley Paris during New York Fashion Week last month. They were hosting a little open-house at their Soho store and we were able to try some out some stuff. They sent each of us home with a bottle of their Anti-Aging foundation and y'all, it's SO good! It smells like heaven and is the perfect match to my fair skin. I realize it's a bit on the high end, but if you're looking to invest – this is what you need to get! But if you're looking for a foundation that's a bit more affordable, I've got two options for you. First up is it Cosmetics CC+ Cream. Talk about magic makeup! This product provides full coverage in a super lightweight formula. Any discoloration or imperfections seriously just disappear! And then for the drugstore makeup-lover, make sure you check out CoverGirl's Ready Set Gorgeous foundation. Oil-free and easy to apply, I have been wearing this foundation for at least a year now and swear by it!